By submiting this form you agree to sign up to receive our newlsetter. You may withdraw your consent of receiving a newsletter by clicking the unsubscribe button in the newsletter or via the contact page. We think, that there are enough plug-ins out there, that make your sound perfect. We think, it is time to make something for people, who like imperfection. And so, we are proud to present The GlitchRack. The GlitchRack comes with a wide variety of effects that try to get the worst out of your sound. -	The KillLimiter: Limiting to a brickwall that has never been harder. -	The Resampler: Samplerates so low, that no soundcard can be bothered to use these. -	The SpeedWobble: playback-speed can be a fickle thing. -	The Overload: A computer can only take so much. It’s only a matter of time, when it drops out. Are you tired of all these perfect plugins all around the Internet? Do you want to stop making everything only better? 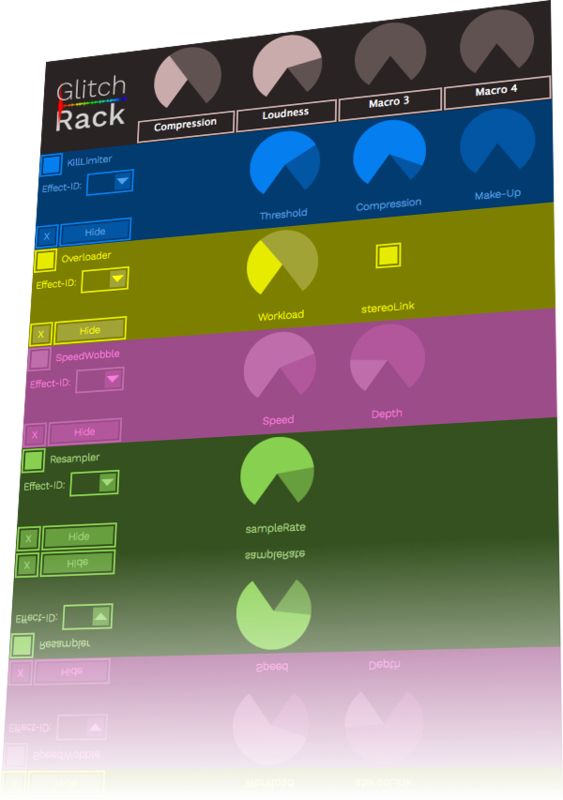 Then this new Effect Rack might just be, what you are looking for. No perfect recreations of analog effect devices. No Algorithms to make the fattest sound. Just pure digital destruction.